For a long time I have wanted to read the myths of the North, but it was only until recently that I got so far. As you may have noticed in the book reviews section, I have gotten myself the poetic Edda and some other famous sagas. Also do I have one of these cheap-bookshop-books about Viking mythology. When I read the short version of the Viking tale of creation, I was struck by the likeness it has with some of the Hermetic creation-myths that I gave in my “Hermetic concepts” article. I couldn’t place the information of John Grant’s little book in my own library though. A quick investigation proved that most of the Northern mythology that we know comes from the so-called prose-Edda, also younger Edda (and the poetic Edda the older Edda) or Snorre/Snorra-Edda. This prose-Edda is the famous work of the Icelander Snorri Sturluson (1178-1241) with much more information than the later compiled (!) poetic Edda. For some reason this more important Edda is not available in my native language, BUT, I found two translations in English on the internet (see bottom of article) in order to make me able to make the correct references. I will follow the story of creation of the Vikings and compare the images to Hermetic symbology. However these two traditions seem to have nothing to do with eachother, this comparison is quite striking. The Corpus Hermeticum (CH) puts this thus: “First of all things, and in very truth eternal and without beginning is God, who is the Maker of the universe” (CH VIII.2). This is a very common notion of God in the Hermetic scriptures. “There was darkness in the deep, and water without form; and there was a subtle breath, intelligent, which permeated the things in Chaos with divine power.” (CH III.1, also see CH I.8). “The deep” in Greek is “abyssos” which is much like the “yawning gap” of the Eddas. The “subtle breath” is not the most usefull translation of “pneuma”, because Scott (see bottom) uses the same translation for other Greek words. “Pneuma” itself is also sometimes translated as “vital breath” or “a fine airy substance”, or “a subtle spirit”, or… “fiery breath”. Darkness and fire/light, just as in the Edda. In CH I.9 there is even a “God of fire”. The Edda says that fire and ice come forth from Niflheim and Muspelheim and these two elements cause creation. There is no counterpart for this image in the Hermetic scriptures. Here creation is either carried out by a “Demiurgos” or a group of lower gods. This last thing we will also encounter later. But now we go to Gylfaginning 5. One of the first results of the creative process in the Edda is the first of the frost-Giants: Ymir/Aurgelmer who is the result of the interaction between the ice and fire. The comparison may be a bit farfetched at first sight, but let me quote CH I.9: “The first Mind (‘nous’) […] gave birth to another Mind, a Maker (‘demiurgos’) of things.” Also “God brings forth Eternity; Eternity the Kosmos; the Kosmos time; time birth and changeableness” (CH XI.2, missing in Scott), and: “The Lord and creator of this universe, who we call God, brought forth from himself a second god which is visible and senseable”, this second god is called the “Kosmos” (Asclepius 8). This Kosmos is the son of God (CH IX.8 and CH X.14). Now we come a bit closer to Ymir and him being the Kosmos. Gylfaginning 5 says: “Not at all do we acknowledge him (Ymir) to be a god. He was evil and all his descendants [too].” This does not fit with several remarks in the Hermetic scriptures the Kosmos is called the second God (CH X.10 for example), but since the Kosmos is not entirely ‘unchangeable’ as God himself, it is (relatively) evil, like Ymir. Also -as we will see- from Ymir comes more creation, while the Kosmos is creation in a way of speaking. Then in the Edda we run into the divine cow Audhumla (Gylfaginning 6). There are no cows in the Hermetic scriptures, but someone told me that Ymir is the ‘Logos’ or creative word. This ‘Logos’ does -unlike in the Gnostic scriptures- not always take part in creation. It is mentioned in some libelli, but in others not. The Ymir/Logos remark did bring me to another interesting link being that between Audhumla and the Logos. In India the Logos is called “Vach” and Vach is also a cow! It is the Logos who came forth from God as a creative force and it is Audhumla who creates as we will see. 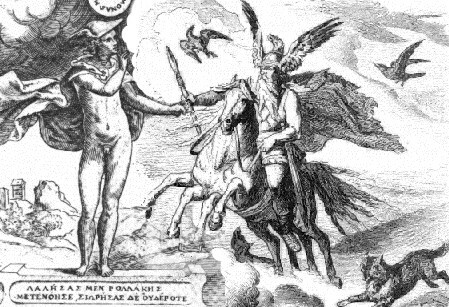 Also Audhumla feeds Ymir/the Kosmos, like the Logos feeds wisdom to creation. In three days Audhumla licks a man from a salt stone. This man is called Bure, the very first man. Bure feels the need to procreate and makes himself a son: Bor. How wonderfully this can be put along with CH I.14 where Antropos, the first and divine man feels the need to create and causes ‘the fall’ and the bisexuality of mankind. But no, there are no men and women in the Edda yet, well just wait: “Bor maried a woman whose name was Bestla” and “It is said that when he (Ymir) slept he fell into a sweat, and then there grew under his left arm a man and a woman”. Bor (the son) and Bestla got three magnificent sons: Odin, Vili and Ve for who I have no counterpart in the Hermetic scriptures… yet! The Edda continues to tell how Ymir was killed and how from his body the physical world was created (the Kosmos of the Hermetica?). From Ymir’s skull the sky was made and four dwarfs were asigned to hold up the corners. The dwarves are conveniently called Austre, Vestre, Nordre and Sudre. Four dwarves and three gods/sons make the often-used number of seven. Is it merely a coincidense that in the Hermetica there are seven governers who -for example- create the perceptible kosmos and its spheres (CH I.9)? Or that there are seven ruling spirits, one for every holy planet CH XVI 13-15)? Both in the Hermetica and in the Edda this divine number of seven are present before the actual creation of mankind. In the prose Edda Odin, Vile and Ve take a few trees and create men from them. Odin gives the humans life and mind, Vili movement and intelligence and Ve the senses. About the mind in man there is much debate in the Hermetic scriptures as you can see in my other article, but it is not specifically said in the Hermetic scriptures who gave men intelligence, senses and the like. With the creation of mankind the Hermetic scriptures turn to much other discussions. The Edda on the other side continues quite a bit after where I ended and after a while even starts over in a slightly different version (with the tree Ygdrasil). There is no use trying to find similarities in these parts, so I end here. Still I find it funny to see how to so different traditions come to (slightly?) similar metaphores to explain such a thing as creation. Some comparisons may be a bit forced, others come really natural. The best part is that after having studied the Hermetic scriptures, I didn’t even have to really look for similar images when reading the Northern myths, which does say something I think…! The Prose Edda in the translation of Rasmus B. Anderson (1879). This text is available online. The Prose Edda in the translation of Arthur Gilchrist Brodeur (1916). Also available online. Edda by Marcel Otten (poetic Edda in Dutch). Creo que estas en una busqueda infructuosa, aunque sea solo por curiosidad. Todas las tradiciones verdaderas, comienzan en el ”orden de los principios”,solo accesible al intelecto puro, luego desarrollan una versión del orden creativo, y luego del orden formativo, propio de esa civilizacion o cultura, con sus caracteristicas psicologicas y mentales propias, que es donde difieren, pero no en el orden de los principios. Siempre ,el agente creador es el Verbo o Logos, por lo cual conocer profundamente el idioma sagrado de esa civilización, es fundamental para su comprension profunda, y creo que esto es imposible si su cadena de transmision está rota. para la zaga del norte, habría que dominar muy bien, el idioma de los bardos antiguos, me refiero a la edad de piedra, y seguir su devenir y mutacion en las siguientes eras. Con respecto al hermetismo, tenemos material cuasi completo, con respecto a los misterios menores, pero nada de los misterios mayores. por lo tanto, de las dos civilizaciones puestas en comparacion, podemos decir que comparten ,ser restos de cadenas iniciaticas rotas, solo curiosidades. I think these in a fruitless search, if only for curiosity. All true traditions, start in the order of principles”,”only accessible to pure intellect, then develop a version of the creative order, and after the training order, characteristic of that civilization or culture, with its mental and psychological characteristics own, which is where they differ, but not in the order of the principles. Always, the creative agent is the Word or Logos, so profoundly know the sacred language of that civilization, it is essential for deep understanding, and I think this is impossible if his chain of transmission is broken. to the rear of the north, would have to master very well, the language of the ancient bards, I refer to the stone age, and follow their evolution and mutation in the following eras. With respect to secrecy, we have quasi material complete with respect to the minor mysteries, but nothing of the greater mysteries. therefore, of the two civilizations brought into comparison, we can say that they share, initiatic be remnants of broken chains, just curious. Quite a Traditionalist tone Ernesto! You are right when you mention the larger and smaller mysteries and from the well-known Northern sources it is usually not clear if they refer to either, if any. The comparison is superficial, agreed. The article mostly concerned my amasement of 5,5 years ago when I recognised certain symbolism.